Apple's senior vice president of retail stores, Angela Ahrendts, has climbed to grab the 13th spot on Fortune's "Most Powerful Women" list for 2017. In 2015 Ahrendts took the 16th spot, and in 2016 she rose to the 14th spot. The top 5 women on the list this year are Sheryl Sandberg (Facebook COO, #5), Abigail Johnson (Fidelity Investments CEO, #4), Marillyn Hewson (Lockheed Martin President and CEO, #3), Indra Nooyi (PepsiCo CEO, #2), and Mary Barra (General Motors CEO, #1). Since being persuaded by Tim Cook to join Apple in 2014 (she previously led British fashion brand Burberry), Ahrendts has been heads down on the tech behemoth’s largest store redesign in 15 years. In May the company launched its long-awaited “Today at Apple” initiative, which seeks to supplement public education through free courses on everything from coding to music production to photography. Apple’s highest-ranking woman, she oversees 60,000 retail employees and is responsible for the in-store experiences of a more than a million daily customers. Research firm eMarketer estimates that the combined revenue from in-store and online sales is nearly $50 billion. Ahrendts was the second executive after Cook—and the only woman—to take the stage at September’s keynote, where she spoke at length about Apple’s “town squares”—the new moniker for its retail stores. Ahrendts joined Apple from Burberry in the spring of 2014, when she said she'd bring a personal touch to Apple's retail management. Three years later she has spearheaded the launch of Apple's next-generation retail store design and "Today at Apple" classes worldwide. 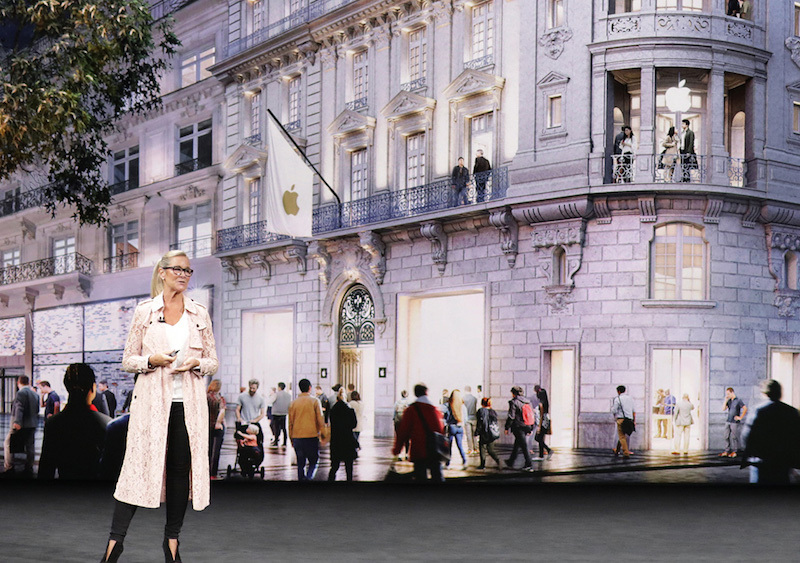 Last week, Ahrendts also appeared on stage during Apple's iPhone X keynote event, where she went into detail about new and upcoming Apple Town Square locations in Chicago, Paris, and Milan. For more information on Fortune's ranking, the site has published a few articles today: explaining the list's continued importance, highlighting the newcomers, and pointing out those who have dropped off the list this year. I don't think she was a good hire , she brought a different way of thinking to apple, that they should charge more , and fashion was more important than tech innovation. she needs to improve at public speaking...I just don't feel the authenticity that other Apple execs bring during keynotes. A meaningless list of self-serving blowhards who have done nothing for the consumer interest. This not news, let alone Apple news. She came off very condescending, I don't buy into her "town square" crap. Retail brick and mortar stores should be all about displaying your products, when in a Apple store you have no clue as to what is for sale and what is someone's own personal equipment. I know that Apple generates a ton of revenue at their stores, I just am not comfortable in their type of environment. she brought a different way of thinking to apple, that they should charge more , and fashion was more important than tech innovation. Or maybe she was brought in because existing management wanted to go more into the direction of luxury and fashion. So did Microsoft under Steve ballmer ..... and how did apple leap frog them....? Curious to see / experience her influences within the retail space as more of her ideas and strategy become implemented. I like the idea of the store becoming a gathering spot, and less of a retail push. That said, I have always felt comfortable going in to use some equipment, get a quick charge, or to simply check out new devices. Unless of course, you go there to buy something. Then you have a bunch of people just hanging around? Dumb idea. The point of a store is to buy stuff or try stuff. Not hang out. It's like she's a PR stunt by Apple to satisfy some agenda. She came across as kind of an idiot on stage that Cook finally let her on. It was easy to see why they waited so long to trot her out there.